Early production version of a Panzerkampfwagen VI ausf E (SdKfz 181) Tiger. This photo was taken sometime after November 1942, when the improved gun mantlet was installed in production vehicles. Combat experience showed that Soviet anti-tank gunners, unable to puncture the 100mm (3.94 inch) front hull armor or the 120mm (4.72 inch) mantlet armor, would aim for the optical sight (the two small circles next to the gun on the mantlet). To prevent damage to the optics, the armor plate was increased over the sight and on the mantlet edges. 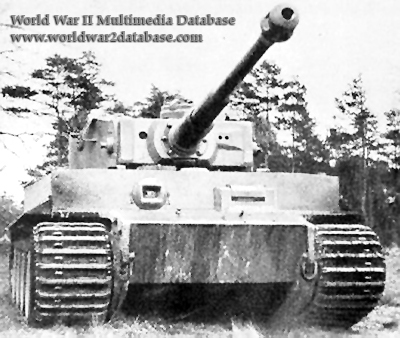 Note that this Tiger lacks track guards on the front or sides of the suspension; removable one-piece side track guards were issued the same month, along with hinged front and rear track guards. The Tiger Ausf E had dozens of minor upgrades during the production run from August 1942 to July 1944. 1,355 Tigers were built before Henschel und Sohn switched to building the Tiger II.